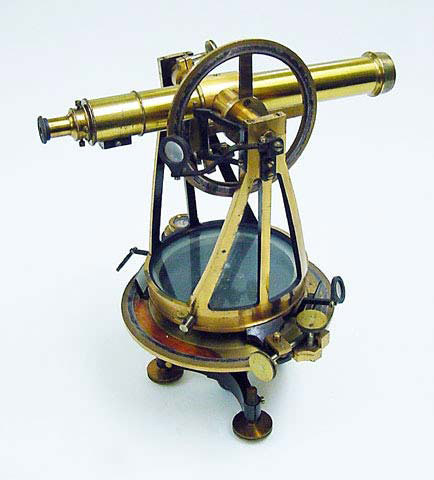 The theodolite surveying instrument was invented by Leonard Digges in the 16th century. Digges was a cartographer born in Barham, Kent around 1515 and died in 1559. A theodolite is a surveying instrument usually mounted on a tripod with adjustable legs. It is used in the field to obtain precise angular measurements for triangulation. Digges used the term ‘theodolitus’ to describe his surveying instrument in his book Pantometria. Consisting of a circular ring divided into 360 degrees, and a pivoting sight with vanes at each end. Tectonicon : briefly shewing the exact measuring and speedy reckoning all manner of land, squares, timber, stone, steeples, pillers, globes. Digges Tectonicon a 1634 edition originally published in 1556. Digges son Thomas brought his fathers achievements to the world's attention. As well as being a cartographer his father was an inventor. Digges also independently invented the reflecting telescope, or the refracting telescope as part of his theodolite to improve the accuracy over long distances of his surveying works. As referenced in his 1591 book Pantometria.